With many parts of Southern California under a blanket of smoke, soot and falling ash from the Canyon Fire 2, motorists should take steps to remove fire-related debris from the exterior paint of their vehicles. It may take more than one wash to remove ash since it will continue to fall for the next several days. “Motorists may have to repeat washings to keep ash from collecting on the vehicle and scratching and damaging the paint,” said Skaien. Motorists should note any water restriction rules in their area before deciding to wash their vehicle, he added. If you can’t park the vehicle in the garage and depending on local weather conditions, if dry, gently wipe the vehicle off with a long-handled car duster to remove the soot and ash. (If there’s a large amount of ash, rinse the ash off of the vehicle and do not attempt to use a duster.) Be sure to dust off the headlights and taillights for maximum visibility. If you have a car cover, use it. A car cover also will help keep ash off of the vehicle and protect the painted surface. If you live in an area that experiences marine-layer moisture, do not dust the vehicle off since ash is abrasive and you may risk scratching the paint. After the fires are over, motorists should inspect and replace, as necessary, the engine air filter and auto technicians should inspect and replace ventilation filters in the passenger compartment. If you haven’t changed windshield wipers for the winter season, change them now before cleaning the windshield with wipers. Make sure the windshield wiper fluid reservoir is filled and spray the windshield first to avoid accidentally scratching it. Keep the sunroof and windows closed. Run the air conditioner on re-circulate until the outside air quality significantly improves. Once the outside air quality is better, make sure to run the air conditioner set on fresh or vent so you’re moving outside air inside to clear the stale smoky smell. If the interior of the vehicle smells like smoke, add a vehicle air freshener to mask the odor. When the smoky airs clears, and to minimize the effects of ash and soot on the vehicle’s clear coat, wax your vehicle in the garage when it’s washed and cool. Use a good quality car wax and follow the directions. Once applied, remove with a clean, soft cloth. 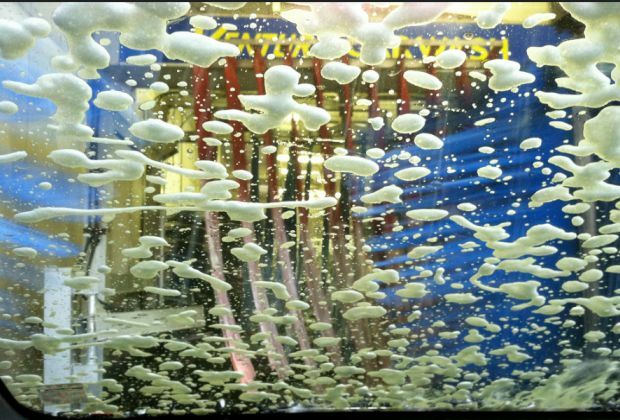 Car wax helps protect the finish against ash, hard water spots and future rainy weather.